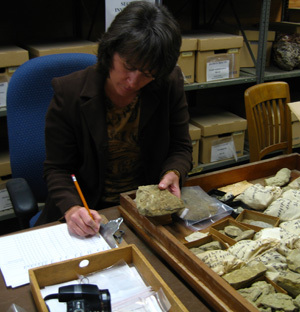 Ramona Urbanek tackling a drawer of specimens from the Cretaceous Boquillas Formation. Both undergraduates and graduate students are hired as research assistants during the year. Many students are able to join with us and publish work in which they were involved. Internships provide students with an opportunity to sample the everyday work of a particular profession. At present most interns with NPL need to find their own funding. Liz Dunn, a former geology student in the Jackson School of Geosciences, worked on Charlotte’s Reef in Comal County, Texas. She was sampling and mapping this Cretaceous coral reef as part of her undergraduate research project. She also helped with the Canyon Lake project and the previous summer worked on a project to relocate the early collection localities in Travis County. Volunteers play an extremely important role at NPL. Some supply specialized skills in subjects additional to those covered by the expertise of the permanent staff, while others help us to stretch our small budget by assisting in the routine work of the lab. The people shown on this page are all volunteers, who work not for a salary, but simply for the satisfaction of getting involved in the work of the lab. New volunteers are always welcome at NPL, whatever their level of expertise.